Acne may not be the most unusual skin problem that you may encounter, but you have to be aware of what it is actually telling you. Truth is, as simple as the condition may appear to be, there are underlying problems that acne reflects. And you clearly have to know about it to achieve a flawless looking complexion and to improve your body condition. Your acne could be a reflection of your lifestyle, your habits, your immune system, and what’s going on inside your body. It definitely tells more than a flawed complexion or a blemish that leaves a mark. 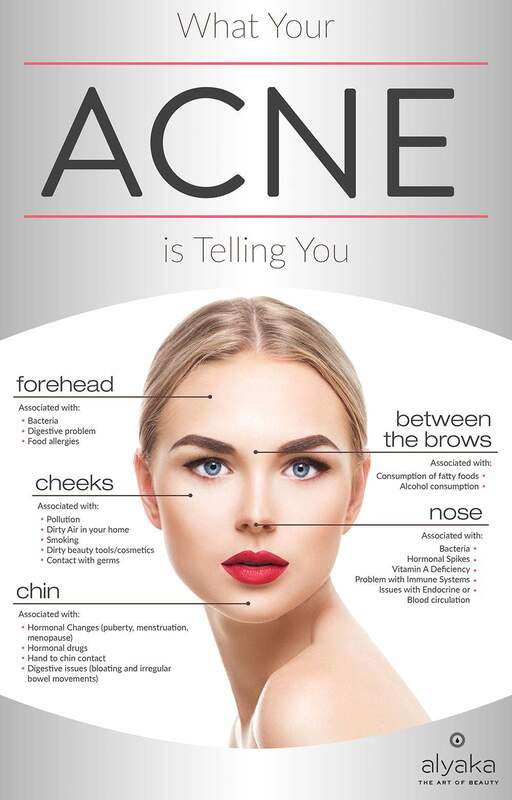 To help you find solutions for your acne problem, here is an infographic from Alyaka, a trusted retailer of organic beauty products and niche perfumes, that features some of the top revelations about your acne, as well as what your acne is telling based on its position.